I don’t customarily plan an entire three course meal around a single ingredient, except to celebrate some seasonal excess, like fantastic tomatoes or the fall mushroom season. I’ve become comfortable letting matcha play a role in sweets, cocktails, and so on, and I have done a matcha flavored cream sauce before, but I never really let it play a starring role in a planned meal. I wanted to test the capacity of matcha to play different roles. In addition to its obvious applications in desserts and sweets, it also has herbal and spice-like qualities I wanted to explore. I thought maybe I would revisit my matcha cream sauce again, but this time make some homemade gnocchi instead of throwing together a quick lunch with some dry pasta from my pantry. In this case, I could let the matcha serve the role of an herb. 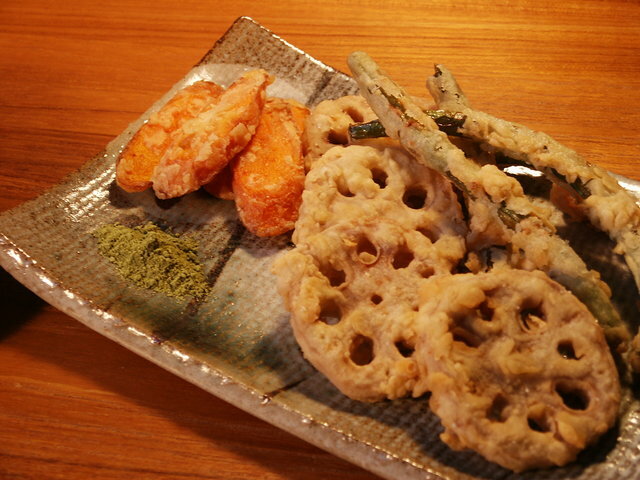 I also wanted to use it as a seasoning, so I thought maybe a simple tempura would be nice. And I couldn’t really envision a three course meal highlighting matcha without it serving a role as a dessert flavoring, so I decided to go way back in my repertoire to produce a green tea cheesecake. I had made a matcha mousse in Germany in 1996 or so, but I think it wan’t until 1998 or so when I decided to make a cheesecake with it. When I first attended FoodEx and Hoteres Japan back in 2004, I was intrigued by the idea of a matcha-jio, or matcha seasoned salt. 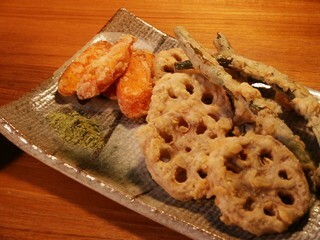 The primary suggested application was as a seasoning for tempura, but I have also seen it used to season oborodoufu (custard tofu) served in small portions. I don’t really make tempura all that often, but I thought that tempura could be analogous to a “fritto misto”, and since tempura was itself a fusion of Japanese and Portuguese cooking, it seemed fitting as a gateway between the European and Japanese elements of the meal I envisioned. Even though I’m at Uwajimaya at least weekly, I don’t really know where to find matcha salt in Seattle. I do, however, have a small mortar and pestle, and a fairly substantial supply of matcha for cooking, since I’ve been functioning as a sales broker for Three Tree Tea. 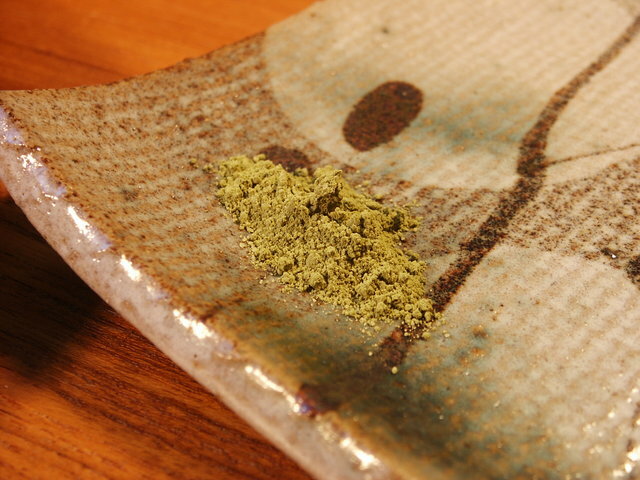 So I ground some salt up to a fine snowflake-like powder, and combined it with a fairly substantial proportion of matcha for cooking (grade A). I spotted some freshly harvested local green beans (ingen), and some well packed Chinese lotus root (renkon). For color contrast I thought a few slices of carrot would be nice. I decided to make tempura the “old fashioned” way, which is not with a batter, but by bathing the vegetables in very cold water with a beaten egg, and dipping into flour. This allows for a very thin coating that allows the colors to come through. I did sprinkle everything a tiny amount of salt after frying before plating. A few weeks ago at La Medusa, Hiromi and I had a nice “sappari” sauced pasta made with a fava bean cream, served with salt-marinated fava beans. I thought it was a good model for what I had in mind for my gnocchi. For the pasta, I wanted the matcha to function much like rosemary or thyme or any other herb would work in a sauce. My goal was to make it recognizable if you were familiar with it, just strong enough that you would miss it if it weren’t there. So I chose to use a very small amount of cutting-board minced garlic (roughly half a clove), 2 tbsp. butter, 2–3 tbsp. cream (unmeasured), and a bit of parmesan. I prepared matcha by whisking about 3/4 tsp. of the powder in about 1/4 cup of my pasta water. I had some salt-water boiled edamame, which I had dropped in an ice bath after cooking. After boiling the gnocchi, which were a simple potato-based gnocchi with no special seasoning, I combined them with the edamame and the sauce and kept cooking a couple more minutes in the cream sauce (adjusting salt as needed). 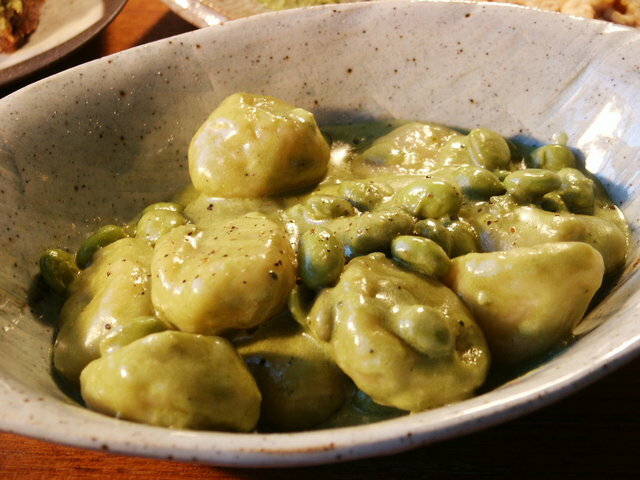 As a tea, matcha can become bitter or astringent when cooked for a long time, so I combined it into the sauce just before adding the gnocchi. Gnocchi seem an ideal gateway between Japanese and Italian cuisine. The mild sweetness of the potatoes in gnocchi and the sweet-savory nature of “dango” or Japanese dumplings seemed to make the medium even more fitting. In fact, the first time I made a matcha cream sauce a few weeks ago, I used a tiny amount of sugar (1/4–1/2 tsp) just to make the sauce smoother. This time I skipped that. If someone served me a matcha cream pasta at a restaurant, I would be happy with either choice. The sauce was simple, clean-tasting, and slightly herby without any noticeable astringency. 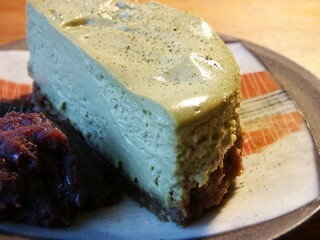 In the morning I baked a moderately-sweetened green tea cheesecake. I am not a fan of the increasingly ubiquitous super-sweet cheesecakes. Matcha does need a bit of sugar for balance in sweets, so I did use a tiny bit more than if I were just doing a simple lemon zest cheesecake that might be topped with some fruit. The base of the matcha cheesecake was essentially 8 oz. Philadelphia cream cheese, 2 tbsp. sour cream, 3 tbsp. sugar, 2 level tsp. matcha whipped with the softened cream cheese and sugar, a few drops pure vanilla extract, and one egg. I made a simple graham cracker crust. I used two very small (maybe 4”) springform pans. After the cheesecake came out of the oven, I made a sour cream and sugar topping which had additional matcha blended in. I served about 1/2 of the small cheesecake per person, which was more than really necessary but not overwhelming. Just before serving, I dusted a bit more matcha on top and on the plate. 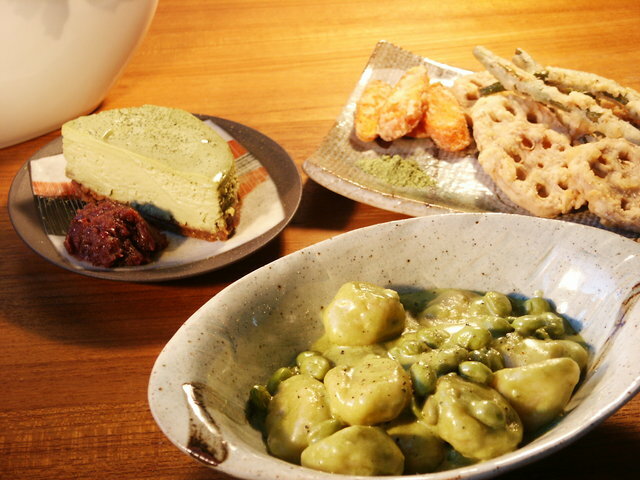 The final product: Gnocchi with edamame in a matcha cream sauce; Renkon to ingen to ninjin no tempura with Matcha-shio, and matcha cheesecake with anko (red bean paste). This month's Is My Blog Burning theme is tea as an ingredient, hosted by A La Cuisine, so please take a look at what other folks have imagined. By Japanese standards, my dishes are probably slightly conventional but still somehow very much my own, so I'm sure you'll find some more radical uses of tea over there.